The Hockey Show, Canada's only campus-produced radio show that strictly talks hockey, is on the road again tonight! 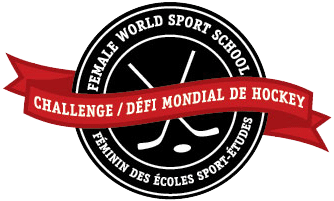 We escape the cozy confines of the studio and venture out into the chilling weather gripping our fine city as Beans and I set up camp at the Female World Sport School Challenge currently taking place at the BellMTS IcePlex! Sixteen of the best AAA Midget programs and Sport School prep programs from across North America are gathering for this tournament, and Beans and I will go over the tournament as well as digging into the world of hockey from the past week! Beans and I will go over the first day of the Female World Sport School Challenge before breaking into the news that seemed to take no one by surprise as the Kootenay Ice will head east at the conclusion of the WHL season to set up shop in Winnipeg at the University of Manitoba as the Winnipeg Ice! From there, we'll look at a group of 11 and 12 year-old girls from Winnipeg who are trying to win the Chevrolet Good Deeds Cup, the Jets were back in action against the Flyers and Bruins, do the Jets/Moose try and get Alberta Golden Bears star Luke Philp, is Laine with the wrong pair, the Jake Muzzin sweepstakes were won by the Maple Leafs, and the Bisons meet up with UBC. It's another busy night of news and opinions as Teebz and Beans put The Hockey Show through its paces at the BellMTS IcePlex tonight! Tonight, Teebz and Beans discuss the biggest tournament for women aged 17 and under in North America, the move of the Kootenay Ice, Polar Bears trying to win the Good Deeds Cup, the Jets playing games, planning moves, missing out on star defencemen, the Bisons men's and women's teams looking at playoff spots, and much more only on The Hockey Show found exclusively on 101.5 UMFM, on the UMFM app, on the UMFM.com web stream! NOTE: There were some technical issues with this episode! Finnish-born netminder Joni Ortio is probably best remembered in North America for the short time he spent in the Calgary Flames organization. The image to the left is him playing the KHL's Vityaz team, but he's certainly seen almost every corner of the planet after stints in Alaska with the ECHL, Stockton with the AHL, and Skelleftea in Sweden before landing with Vityaz this season. He's never had poor stats on any of his teams, but it seems he just can't catch a break. That is, until today. It was another typical KHL game between Vityaz and Traktor Chelyabinsk. The game was tied 2-2, Vityaz was defending their zone as they attempted to gain control to have the delayed penalty called, and then this happened. Oh no. Traktor's Marcel Sholokhov attempted to saucer-pass the puck over the stick of Vityaz's Alexei Makeyev, but the bouncing puck hopped over the stick of defenceman Alexei Petrov and went the length of the ice and into the abandoned net that Vasily Demchenko had left in favour of the extra attacker. That's about the worst case of luck that a team can have when it's preparing to go on the power-play. What makes this goal even more special? Well, since no from Vityaz had touched the puck to cause the referee to whistle the play dead, the last player who did touch the puck would be credited with the goal. And according to the scoring summary, here's your goal scorer. Joni Ortio's first career goal at the pro ranks came at 17:01 of the second period to put Vityaz up 3-2. The final score in today's game? That same 3-2 score, and that means your game-winning goal scorer was none other than goaltender Joni Ortio! Ortio joins four other goaltenders this season who have scored goals in Tristan Jarry of the AHL's Wilkes-Barre/Scranton Penguins who scored on November 14, Ian Scott of the WHL's Prince Albert Raiders who scored on November 16, Atte Tolvanen of the NCAA's Northern Michigan University Wildcats who scored on December 7, and Roman Durny of the USHL's Des Moines Buccaneers who scored on December 18. If you're keeping track, there has now been a goalie goal scored in three consecutive months and in five major leagues in the hockey world. The ECHL and NHL have yet to provide us with a goalie goal this season, but there's still lots of time on the calendar left! Has there ever been a year for goaltenders like this one? The battles for playoff spots and seedings within Canada West are already being contested, and this week's slate of games would only further the narratives being written for each of the eight Canada West teams. If you're wondering why this is a Tuesday edition of The Rundown, the Mount Royal Cougars and Calgary Dinos met tonight in the Crowchild Classic, and those results needed to be added in! As it stands, Manitoba and Alberta are locked in a battle for home-ice advantage throughout the playoffs. UBC and Saskatchewan are battling for third- and fourth-place while trying to track down Alberta and Manitoba. Mount Royal and Regina are jockeying for fifth- and sixth-place while trying to hold off Lethbridge's late surge this season. Calgary isn't mathematically out of the race, but they've embraced the spoiler role. Those stories continue this week as we check the action and results on The Rundown! FRIDAY: The first-place Manitoba Bisons headed west to southern Alberta as they met the Lethbridge Pronghorns for a two-game set. The Bisons held a slim one-point lead over Alberta for first-place in the conference while the Pronghorns trailed Mount Royal by four points for the final playoff spot. Manitoba would send Lauren Taraschuk to the crease and the Pronghorns gave Alicia Anderson the assignment on Friday. After the dismissal of Lethbridge head coach Michelle Janus earlier in the week, there was some concern that the Pronghorns may come out flat. They put those concerns to rest right away as the Pronghorns were far more aggressive compared to how they've played in the past. This benefited them greatly as they seemed to keep Manitoba on their heels for the majority of the opening frame while getting a number of chances on Taraschuk. However, the big Manitoba goalie was equal to the task, and the two teams would head to the second period still 0-0. The second period belonged to Anderson as she stymied the Bisons power-play units early on after they had chances. A Manitoba power-play saw the Pronghorns fail to find room to get to Taraschuk as the Bisons penalty-killing units were on their games. It wasn't until late in the period that Manitoba would finally be able to put it all together. After Anderson stopped a two-on-one, Mekaela Fisher would find the back of the net when she beat Anderson at 17:28 to Manitoba up 1-0. Before the ink had dried on the scoresheet, the Bisons doubled their lead just ten seconds later when the Bisons won the face-off, fired a puck in on Anderson, and Karissa Kirkup poked home the puck in the scramble as Anderson couldn't cover the puck for the 2-0 lead! Manitoba would take that two-goal lead on the strength of a 24-12 advantage in shots into the third period. Whatever was said in the room during the intermission seemed to light a fire under the Pronghorns as they weren't content to simply fold their tents. The aggressiveness of the Horns would pay off midway through the period on the power-play. Kyra Greig's power-play tally - one that I'd assume Taraschuk wants back - made it a 2-1 game at 8:03 of the third period, and this game suddenly took on a new feeling as the momentum began to swell behind the Pronghorns. Manitoba looked to pop that balloon of momentum, and they would strike back just two minutes later when Fisher did all of the work coming off the half-boards and wiring a shot that Anderson stopped, but Courtlyn Oswald would deposit the rebound behind Anderson at 10:19 to make it a 3-1 contest! Again, the Pronghorns just refused to die this weekend when it came to their play, and they would pull Anderson late for the extra attacker. After calling a time-out, the Pronghorns came out of the pause with some fire in their skates again, and Alli Borrow would make this a one-goal game when her shot found twine behind Taraschuk at 18:23 to make it 3-2! However, 35 seconds later saw Nastasha Kostenko hit the empty net with a goal, and that would do it for the scoring on this night as the Bisons skated to the 4-2 victory! Lauren Taraschuk earned her 14th win of the season with a 15-save performance while Alicia Anderson suffered loss despite making 30 stops. SATURDAY: There was a new bench boss behind the Lethbridge Pronghorns on Saturday as they introduced Parry Shockey as the man who will guide the team through the remainder of the season. Lethbridge needed points against Manitoba of any type to try and close the gap between them and both Cougars teams, so they went back to Alicia Anderson as their netminder. Manitoba loooked to add more points to their total this season, so they came back with Lauren Taraschuk in her 21st appearance this season. While Manitoba looked to control the pace of this game, it would be the Pronghorns who took control on the shot counter as they looked to pepper Taraschuk with shots from everywhere on the ice. While the Pronghorns would end the period with a 16-8 edge in shots, the two netminders were content to keep this game tied at 0-0 through the first 20 minutes. The two teams would trade power-play chances early in the second period with no successes seen, but a power-play midway through the period would warrant our first goal. Alexandra Anderson's blast got through traffic and past Alicia Anderson at the 10:00 mark, and the Bisons went up 1-0 with the power-play marker. That seemed to give the Bisons life for the second half of the period as they took control away from the Pronghorns. 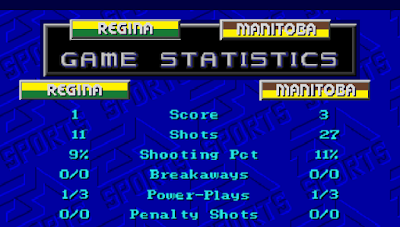 However, no other goals would be seen as Manitoba went into the third period up 1-0 but trailing 26-24 in shots. Manitoba looked to close out the one-goal game by starting the period playing uptempo hockey. Anderson was equal to the task, though, as she turned away a number of chances. The Pronghorns would see a few chances in the Manitoba zone, but it seemed that they simply couldn't match Manitoba's firepower. Once again, Lethbridge pulled Anderson for the extra attacker late in the game, and this move would prove fortuitous! Alli Borrow with her SECOND key marker in two nights TIES THE GAME! Alli Borrow would find room through Taraschuk for the second game in a row, and this goal with 24 seconds remaining helped push the game into overtime tied 1-1! Free hockey for all! The four-on-four overtime period was played as wide-open as any I've seen in my time watching this game. Chances and shots were had at both ends of the ice, but neither Taraschuk nor Anderson would allow a puck to pass them. The three-on-three overtime period was just as crazy as Manitoba was awarded a power-play, but Anderson was once again stellar in keeping the Bisons from victory. After ten minutes of overtime in which Manitoba outshot Lethbridge 18-7, we'd need a shootout to determine a winner! Alli Borrow would shoot first after being the late-game heroine, but she was stopped by Taraschuk. Jordy Zacharias stepped up for Manitoba with their first shot, and she was automatic as she beat Anderson to put Manitoba ahead. Both Mikaela Reay and Alanna Sharman were stopped in Round Two which left Kyra Greig one chance to keep this game going. Taraschuk outwaits Greig to force her to miss the net, and the Manitoba Bisons claim victory in the shootout by a 2-1 score! Lauren Taraschuk stopped 40 shots for her conference-leading 15th win of the season while Alicia Anderson deserved a better fate on this night after stopping 55 shots in the loss. FRIDAY: Alberta began the weekend one point back of Manitoba in the race for first-place, and seven points up on UBC. Regina was one point up on Mount Royal and five points up on Lethbridge, so they needed points to maintain their hold on fifth-place despite going into a place where the visiting club rarely wins in Clare Drake Arena. Alberta started Kirsten Chamberlin while Regina started Morgan Baker. This recap doesn't need a lot of words because there wasn't a lot happening for one of the two teams. Alberta saw Kelsey Tangjerd redirect a shot past Baker at 9:30, and Abby benning teed up a shot low blocker-side on Baker at 14:36 to make it 2-0 for Alberta through one period of play. The second period was more of the same as Autumn MacDougall ripped a backhander over Baker's shoulder at 10:36, Kennedy Ganser lasered a wrist shot past Baker on the power-play at 13:31, and Ganser added another at 16:18 to end Baker's night as Jane Kish came in to stop the bleeding. The good news? Kish didn't allow any additional goals. The bad news? Regina couldn't solve Chamberlin on a night where Alberta dominated from puck-drop to the final horn. Alberta wins easily in a 5-0 victory. Kirsten Chamberlin made 17 stops for her eighth win and fifth shutout of the season while Morgan Baker suffered the loss, making 19 saves in 36:18 of work. For the record, Kish stopped all 12 shots she faced in the 23:42 she played. SATURDAY: After a rather listless Friday night, there was hope the Regina Cougars were saving themselves for a big Saturday. Alberta was looking for a sweep as they continued their hunt for a top-two finish and a first-round bye. Halle Oswald got the call for the Pandas while Jane Kish was given the start for the Cougars after closing out Friday's game strong. The only problem for Kish? She didn't get much help. The Pandas came out and dominated the game in the opening frame once again, but Regina did their best to skate with the Pandas. However, penalties would haunt the Cougars in the first period, and the Pandas would eventually strike with the extra player on the ice. Alex Poznikoff opened the scoring at 12:54 on the power-play after Autumn MacDougall's shot was redirected to her, but that would be the only goal of the frame as the Pandas took a 1-0 lead and a 7-5 advantage in shots to the dressing rooms. The second period saw the two teams clean up their physical play, but that gave Alberta the edge with their speed and skill. Kish was outstanding in turning away the Pandas time and again, but an offensive zone draw that saw MacDougall win the draw directly to Poznikoff who wired a shot past Kish made it 2-0 for the Pandas at 6:43! It would be the only goal of the middle stanza, but Alberta controlled the play as they outshot the Cougars 12-3 in the period and 19-8 overall. Regina's penalty-killing units would be called upon twice in the third period, but they'd escaped unscathed only once as the Pandas struck on the first opportunity. Regan Wright would convert on the power-play at 6:24 to make it 3-0 for the Pandas. 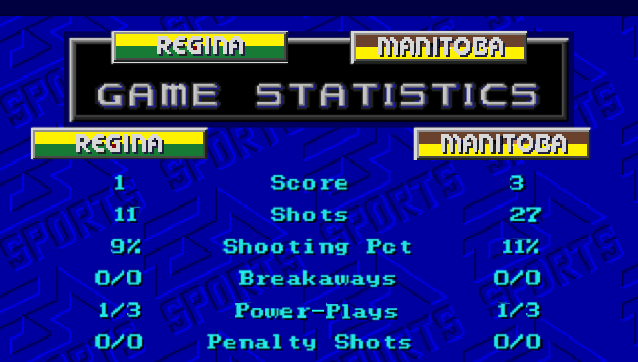 Regina would use a power-play of their own to finally break the shutout streak that Alberta held over them - a total of 234:39 this season - when Nikki Watters-Mathes' blast got past Oswald at 14:39 to make it 3-1. However, Alex Poznikoff would cash in the hat trick goal when she hit the empty net at 19:18 as Alberta swept the season series with the 4-1 win on Saturday. Halle Oswald made 13 saves for her seventh win of the season while Jane Kish was on the losing end of a 26-save effort. FRIDAY: In what might be the most compelling match-up of the weekend, the third-place UBC Thunderbirds played host to the fourth-place Saskatchewan Huskies with one point separating the two teams. Both teams were looking to claim a stranglehold on that third-place standing while trying to track down one or both of Manitoba and Alberta. Tory Micklash was sent out to the crease for UBC while Jessica Vance got the nod for the Huskies. To say this game was physical would be an understatement. There were penalties called all over the place by the officials as they appeared to want zero contact between players on this night. Nevertheless, a game was to be played as the skirmishes between the teams only served to highlight the importance of the points between these two teams. Neither team would find the back of the net in the first despite the power-play opportunities, so we'd head to the second period with UBC leading 7-3 on the shot counter and Saskatchewan down head coach Steve Kook as he was ejected at 15:24 of the first period! Saskatchewan didn't put up much of a fight in the second period as UBC came out buzzing, peppering Vance with shots throughout the period. Vance was sharp, though, as she turned aside all shots in the period to keep this game knotted up at 0-0 despite both teams having chances on the power-play yet again. With UBC up 20-9 in shots, we'd move to the third period still tied with goose eggs. It would be on a power-play against UBC early in the third period that saw the game's first goal recorded, but it would be the penalized team who capitalized! Ashley McFadden takes the pass from Shay-Lee McConnell as she attracts all the defenders, and McFadden goes high on the glove side past Vance on the shorthanded breakaway to put UBC up 1-0 at 5:18! Penalties throughout the remainder of the period really stifled any comeback that the Huskies tried to mount, and a check-to-the-head penalty late after Vance had gone to the bench for the extra attacker killed any hope of the Huskies tying the game. The UBC Thunderbirds earned the 1-0 victory! Tory Micklash set a new UBC record with her tenth win of the season while posting her fifth shutout of the campaign after stopping all 16 shots she faced while Vance made 26 shots but fell one goal short on this night. SATURDAY: If Friday was a spirited game between the T-Birds and Huskies, the rematch on Saturday looked like it was going to be another game with all the makings of playoff hockey between these two rivals. Micklash and Vance would stare one another down from 200-feet away as these two teams geared up for another battle! These two teams started the game by trading chances on each other's netminder before the physicality ramped up. Saskatchewan was whistled for three penalties in the period to UBC's single infraction, but neither team would capitalize on the advantages. At the end of one period, UBC led 11-8 in shots, but the game was deadlocked at 0-0. The second period was more of the same as the two teams again traded chances with the goaltenders standing tall. Despite trading power-plays in the period, neither team would find a lead by the time the second intermission began. The game was still 0-0 despite UBC holding a 23-13 margin in shots on goal. The first goal of the game would come off the stick of Ireland Perrott as she picked up the loose puck along the boards, skated to the high slot area, and fired a shot high through traffic and past a screened Vance at 7:37 to put the Thunderbirds up 1-0! One minute later, Danielle Nogier would be whistled for a double-minor for throwing a check to the head, and the Huskies had to kill an extended power-play. The Thunderbirds, however, would find a goal on this opportunity when Hannah Koroll danced around a Saskatchewna defender to find a passing lane into the slot where she went tape to tape with Kenzie Robinson who one-timed the feed past Vance at 10:40 to put the T-Birds up 2-0! From there, the UBC Thunderbirds protected the lead as they swept the series on the strength of a 2-0 win! Tory Micklash made 15 saves for her 11th win and sixth shutout of the season while Jessica Vance made 27 saves in the loss. FRIDAY: The Mount Royal Cougars could legitimately control their own fate with a couple of wins against the Calgary Dinos this weekend as the six points would vault them ahead of Regina and put some distance between themselves and Lethbridge. Calgary, meanwhile, wasn't mathematically out of the race yet, but they could spoil the Cougars' plans in moving up the standings. Zoe De Beauville was sent to the nets for the Cougars while the Dinos opted for Kelsey Roberts to defend their net as the Crowchild Classic series was set to go. Both teams came out cautiously as neither side seemed to want to give up scoring chances, but things began to open up as the two teams pressed for offence. Despite exchanging power-plays late in the period, neither team would dent twine as Mount Royal led in shots through one period at 11-7, but the teams were still tied at 0-0. Mount Royal was the more aggressive team in the second, pressuring the Dinos early on to go along with a power-play chance on which they failed to convert. That being said, defence builds momentum, and the Dinos turned the weathering of the storm into a positive midway through the period. Holly Reuther fed Priya Sidhu with a pass as she turned out of the corner, and the wide-open Sidhu one-timed the feed past De Beauville to put the Dinos up 1-0 at 11:30! Despite the Cougars turning up the pressure once again, Kelsey Roberts was in the zone as she denied all chances through 40 minutes. Through two periods, Calgary led 1-0 despite being down 24-9 in shots! The Cougars just kept coming in the third period, but Roberts was incredible as she kept the one-goal lead intact. However, the waves of Cougars attacks finally paid off late when Mackenzie Butz loaded up a clap-bomb that got through traffic and past Roberts with 56 seconds to play to send this game to overtime! In the four-on-four overtime, we'd get out game-winner. Delaney Frey uses the defenders and Chelsea Court as screens as she cuts to the middle and let a wrist shot go that eludes the glove of De Beauville as the Clagary Dinos take this game in overtime by a 2-1 score! Kelsey Roberts made 35 stops for her fourth win of the season while Zoe De Beauville took the loss on an eleven-save night. TUESDAY: This game is the reason for The Rundown being delayed as the second game in the series as part of the Crowchild Classic went tonight at Flames Community Arena. With points of any kind tonight, Mount Royal could move into fifth-place in Canada West. Calgary, who virtually needs to win every one of their remaining five games, was looking to make things interesting once again as they looked to spoil Mount Royal's party. Zoe De Beauville and Kelsey Roberts would square off once again in the nets. Just as they did on Friday, Mount Royal came out and looked like the more aggressive team. Roberts made an outstanding save in the first minute off Tianna Ko, and that may have foreshadowed the remainder of the game because Roberts was on fire again this night. Neither team would find twine in the opening period, though, and we'd move to the second period tied 0-0 and with MRU leading 10-5 in shots. The Dinos decided to shift momentum in the second period by taking the game to the Cougars, and it seemed like they would take the lead when Rachel Paul was hauled down on a breakaway, sending her to center ice for a penalty shot! Paul broke and went high on De Beauville, but it also went over the bar and off the glass, leaving this game tied 0-0. Paul, however, would have her revenge minutes later. Paul ripped a wrist shot high on De Beauville, and this one would dent twine as the Dinos jumped ahead 1-0 at 15:37! The period would come to a close with that one-goal lead holding for Calgary despite trailing in shots by a 17-10 margin. Mount Royal would tie the game before the water had frozen on the ice for the third period. Off an offensive face-off zone win by Nicolette Seper, Anna Purschke wired a shot through traffic and past Kelsey Roberts just 28 seconds into the third period to tie the game at 1-1! Calgary wouldn't waste any time in restoring that lead, though, as they came roaring back two minutes later. Rachel Paul's initial shot off the face-off draw back went wide, but the bounce off the end boards allowed Taylor Beck to chip the puck up and over the pad of De Beauville to put the Dinos back out in front 2-1 at 2:22! From there, Kelsey Roberts went back to work in denying all chances by the Cougars including a couple of odd-man rushes and some excellent chances from in front. When the final horn sounded at the Saddledome, the Dinos had wrestled three points away from the Cougars with the 2-1 win! Kelsey Roberts was exceptional again tonight as she made 26 stops for her fifth win of the season while Zoe De Beauville made 13 stops in the loss. NOTE: Teams in yellow and italicized have clinched a playoff spot. Four playoff spots have been claimed as UBC used two big wins over Saskatchewan to solidify their hold on third-place while Saskatchewan backed into a playoff spot thanks to Manitoba defeating Lethbridge. With 12 points remaining this season over the next two weeks of games, let's take a look at the scenarios that present themselves this weekend. First off, both Manitoba and Alberta can claim the top-two spots in the conference if Manitoba wins one of the two games in regulation against UBC or both Alberta and Manitoba claim a total of three of six points in their respective series this weekend. Regardless of the tie-breakers, UBC would not be able to catch either team in the standings. Calgary, to make the playoffs, has to win out. The only team they hold the tie-breaker over is Mount Royal after this past weekend's games where they claimed five of six points against the Cougars. The series against Regina would make things very interesting if the Dinos sweep this series, but the fact still remains: the Dinos have to win out and get a little help if they hope to make the playoffs this season. If Mount Royal and/or Regina can collect three of six points this weekend AND Lethbridge loses both games in regulation, both teams will clinch playoff spots while Lethbridge's playoff push would end. This week is literally do or die for teams looking to make a final push as we near the playoffs. Will we see a shake-up in the standings? We'll find out on Sunday when the dust settles! Ladies and gentlemen, I'd like to introduce you to the Winnipeg Polar Bears. I have no affiliation with the team other than writing this article, but they're looking to carry on a tradition of giving back like other Manitoba hockey teams have as part of the Chevrolet Good Deeds Cup! These young women are the only all-girls team to make the group of ten finalists from across Canada, and their inclusion was announced during Saturday's NHL All-Star game broadcast on Sportsnet! How cool is that? "We hope that everybody votes for it because we hope we can raise more money," said Heather Kirk, 11, who plays defence for the Bears and was the driving force behind getting the team involved in the competition. "It's for a good cause. It doesn't take very long to just watch a one-minute video." Heather first started volunteering at Siloam three years ago, when her mom, Rebecca Kirk, took her family along to one of her volunteer shifts. I'd say that the work being done by Heather is outstanding. Having volunteered a number of times at Siloam Mission myself, I can say that they're constantly needing people to do a variety of jobs there in a volunteer capacity. Most of the funds that Siloam Mission has and makes goes directly back into helping those in need, especially in seasons like winter where a warm bed is often hard to find for those without homes. Here's why you need to get over to the Chevrolet Good Deeds Cup website and start clicking on the Polar Bears' video. The team has until February 9 to accumulate as many views of their video as possible whether it be by social media, on YouTube, or via the Chevrolet Good Deeds Cup website. In fact, the video below is their one-minute effort to try and get Siloam Mission some big money! So why is this important, you ask? By becoming one of the ten finalists, the Polar Bears have already earned Siloam a $2,000 donation and a prize package for the team. That $2,000 can be used in a variety of ways by Siloam Mission, and it will certainly be appreciated. It's important to remember that clicks and views are important, though, as becoming one of the top-three teams in the contest will fetch Siloam Mission another $5,000 in donation money so start clicking the above video and visiting the sites linked above to add views to the Polars Bears' total! If the Polar Bears win the Chevrolet Good Deeds Cup in 2019 after a panel of judges evaluate the final three teams' videos and efforts, they'll earn a cool $100,000 for the charity associated with that team! The team also gets a winner's ceremony in their hometown and will be featured on nationally broadcast television. Not bad for a little volunteer work, right? If you remember, last year's winners of the Good Deeds Cup was The Pas Huskies from here in Manitoba, and we want that Good Deeds Cup to stay in the Keystone Province. Get over to the Chevrolet Good Deeds Cup website and give the video a few watches. For a few minutes of your time, you could help hundreds of people who could use a break when it comes to their situations. People helping people is always a good thing. Seeing these incredible 11- and 12-year-old girls doing some great altruistic work that could result in an incredible monetary windfall is why I clicked and watched the Polar Bears' video a number of times already! This is a more personal article today as a man who I admired and respected greatly was honoured posthumously by a local hockey team for his contributions on and off the ice to the team's success. Wayne Deschouwer and I actually didn't cross paths through hockey, though. He and I were both slo-pitch umpires, and I was routinely one of his recruits for tournaments where he needed umpires. He loved being an umpire as much as he loved hockey, and he expected that one was to do the job as he expected if one wore a uniform. Tonight's celebration of Wayne Deschouwer was something Wayne would have loved, and I'm hoping the big guy was watching from his place in heaven and enjoying every second of being honoured for all he did. Here is video taken by Tom Hallick of the entire tribute to Wayne. It's 14 minutes in length, but if you knew Wayne this will feel like the shortest 14 minutes of your life. Thanks, Tom, for posting this video! Wayne Deschouwer was a great man who loved life, loved being around the rink, loved being on the diamond, and was a great inspiration for me as an umpire. He was taken far too young from this world, and I'm going to miss him dearly this summer. It just won't be the same not hearing his laugh, seeing his smile, and taking his usual volley of good-hearted ribbing he'd dish out. Rest in peace, Wayne. You'll always be remembered by me. Thanks for making me a better person, a better umpire, and for being an inspiration to many. 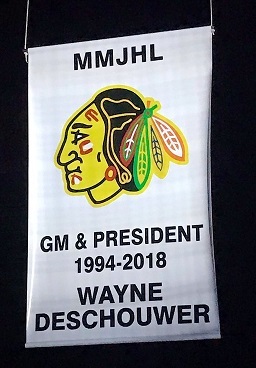 This banner hanging in Eric Coy Arena is the memory of a man who only lived to make the lives of others better, and I'm proud to say I'm one of those whose life was made better by knowing Wayne. Until next time, raise your sticks high in honour of Mr. Wayne Deschouwer! In a move that seems rather hurried considering there are five games remaining in this Canada West season, the University of Lethbridge Pronghorns today announced that they have hired former WHL head coach and former Pronghorns men's assistant coach Parry Shocker as the women's team's interim head coach along with former Pronghorns women's head coach Doug MacLeod who will run practices during the week. Less than a week after dismissing head coach Michelle Janus, I wouldn't have expected this announcement so soon, especially considering that current assistant coach Hailey Wood does have head coaching experience with the squad. The Pronghorns looked energized against the Bisons last night, so why was there a rush to replace Janus so quickly with a man who has hasn't coached women's hockey in his entire career? Shockey's hiring is a curious one. After finding success alongside Mike Babcock in winning the 1994 CIAU men's national hockey title, Shockey made the jump to the WHL where he was named as an assistant coach for the Spokane Chiefs in 1994-95. After spending that season and half of another with Spokane, he was hired as the head coach of the Lethbridge Hurricanes following the one-year suspension of head coach Bryan Maxwell. After fulfilling one year of his two-year deal with the Hurricanes, however, Shockey resigned his position with club. It appears he was being courted by several teams to become the head coach, and he eventually was hired by the Regina Pats to be their bench boss in the summer of 1997. After going 46-21-5 in his first season and losing in the WHL Eastern Conference Final to Brandon, the Pats made a surprising move by firing Shockey just nine games into the 1998-99 season. Shockey would return to the game in 1999 at the NHL level where he worked as a scout for the Los Angeles Kings for the next four seasons. In that career, I assume the Kings would have him working as a WHL scout being that he had coached against some of the players and knew coaches and management from some of the team. However, Los Angeles would draft a total of four WHL players in the four years he was a scout, and never once selected a WHL player higher than the fourth round or the 104th pick. Defenceman Aaron Rome, picked 104th overall in 2002, was the only player of the four to play in the NHL, and he never suited up for the Kings once. He was traded on the day he was drafted to the Minnesota Wild in exchange for Cliff Ronning. I've never been a scout, but I'm fairly certain that draft history wouldn't put much confidence in me. In 2004-05, Shockey returned to the WHL as the head coach of the Moose Jaw Warriors in a rebuilding year. Things didn't go well for Shockey or the Warriors as he led them to a 2-23-5-1 record by December 7 when the Warriors had seen enough, firing Shockey after he had been hired six months earlier by GM Rick Dorman who himself was fired one month into the season. Shockey's team didn't record a win until the 20th game of the season, and the start was the worst of the franchise's then 21-year history. Since then, Shockey has coached one season of AAA Midget hockey in Alberta in the last 14 years. So why is he being brought in for five games again? Doug MacLeod has a little more experience with the women's game, thankfully, as he was a former head coach of the Lethbridge Pronghorns women's program from 2001 to 2008, and moved to become a Regional Scout in Alberta for Hockey Canada's women's teams. He too worked with Mike Babcock and Parry Shockey on the CIAU-winning 1994 Pronghorns men's team, and he's been involved in coaching for 44 years. His last coaching job, however, was with the Pronghorns in 2008. So here's the biggest question: why did Lethbridge hire two men who haven't coached in the last 14 years and 10 years, respectively, to run a program for two weeks? First, I would hazard a guess to say that the vetting process for these two was extremely short being that they've both worked for the University of Lethbridge previously. Granted, both haven't been at Lethbridge for over a decade and I'm certain standards in Human Resources departments have changed over that time, but they've been hired nonetheless. Second, if these two men are truly interim coaches, this gives the University of Lethbridge some time to start looking for a new coach long before this season is over without worrying about how this season finishes. There are likely going to be a number of coaches whose seasons are wrapping that may want to jump into the ultra-competitive Canada West Conference, so this could allow the university a chance to get a jump on interested candidates. Third, as you know, Lethbridge is still within striking distance of a playoff spot as it seems that neither Regina nor Mount Royal had any interest in making Lethbridge's task any harder yesterday. After the dust settled on last night's games, the Pronghorns found themselves five points back of both Cougars teams with five games and 15 points to go on the season. If this hiring pays dividends by elevating Lethbridge's play, there could be a three-way race for the final two playoff spots. This is an interesting move no matter how one cuts this story, and I'm curious to see how the season unfolds with Shockey and MacLeod calling the shots over the next 14 days. The Pronghorns have a lot of work to do if they hope to make the playoffs this season, but these two men have a pile of experience when it comes to coaching, albeit not much in the last decade of play. Whether the Pronghorns make the playoffs or not this season, it's fairly clear that the Michelle Janus era is officially over for good at the University of Lethbridge. Make no mistake that the women showed up and nearly stole the show tonight at the NHL All-Star Skills Competition. Kendall Coyne absolutely lit the ice on fire with her lap in the Fastest Skater event. Brianna Decker only went out and won the Precision Passer event. Rebecca Johnston demonstrated the hands needed in the Puck Control event. Renata Fast blew up targets in the Accuracy Shooting event. Yes, the women can play. But you already knew that. In fact, if you've been reading this blog for any length of time, you're very aware that these are four of the best hockey players on the planet. So why am I writing about goalposts moving? merchandise on their backs, eyes on their TVs, and more. I have been a long supporter of women's hockey, and I truly believe the game is more akin to Olympic hockey with speed and skill being the highlights, and I'll take that to the grave as my reason for spending so much time watching the women's product. Here's the thing, though: the NHL is in San Jose this weekend to promote THEIR product. The invitation to the women this season followed last year's invitation of Hilary Knight, Amanda Kessel, Meghan Duggan, and Hannah Brandt to the All-Star Game in Tampa Bay where the same boisterous social media warriors got on their soapboxes, pounded fists on chests, and screamed about how people should be watching the women's game. While Coyne and Decker arguably made this year's inclusion of the women at the Skills Competition more memorable with their performances in the events they were demonstrating, I'm going to wager a bet that you won't see an uptick in attendance at women's games nor will you see any sustained support for the game after tonight's performance. Now you may be asking, "Teebz, if you support the women's game, how can you say that?". The reality is that the NHL All-Star Game is there to showcase players and their talents, but if you have no way to see this talent regularly or don't know how to watch this talent, you likely will forget how good these players are, ultimately forgetting how good they were this week. Don't be angry - that's how our minds work. There's an expression in hockey that sees teams in the Pacific time zone often using when it comes to voting on year-end awards due to the concentration of voters who live on or near the east coast of North America. This "east coast bias" term is used because most games in California start some three hours after all other games do - 10pm in most eastern markets - so the perception from the west coast is that most of the east coast has already turned off the broadcast since no one wants to stay up until 1am watching hockey. I'm not sure this holds true with the exposure that all of the NHL gets with the broadcasting deals they have - Brent Burns won the Norris Trophy in 2017 and Drew Doughty won in 2016 - but they're the only two players who play or have played in the Pacific time zone to win the award. There has yet to be a Vezina Trophy winner from the Pacific time zone, and the only Hart Trophy winners from that time zone are Corey Perry and Joe Thornton in a year where he was traded from Boston to San Jose. What these writers should be howling about is the fact that you can't find women's hockey anywhere on television - the single largest media influencer in today's households. The NHL? You can find it nearly anywhere in Canada thanks to Rogers broadcasting games on Sportsnet, Sportsnet360, CityTV, and CBC. You can see men's hockey on TSN thanks to the World Junior Championship, the Spengler Cup, the World Championship, a handful of NCAA games, the RBC Cup, and a handful of other Hockey Canada-supported events. Men's hockey is everywhere in Canada, and it's why it dominates most highlight shows and sports newscasts. You know what isn't everywhere in Canada? You get three guesses. If you guessed "women's hockey on TV", you'd be a winner. Sportsnet makes it seem like they're doing the world a favour when it comes to broadcasting four regular season games, the CWHL All-Star Game, and the Clarkson Cup Final. Sportsnet owns the rights to U SPORTS broadcasting and will show the U SPORTS Men's National Hockey Championship, but doesn't even bother to send a reporter to the Women's National Hockey Championship. You know why you're all talking about Kendall Coyne's incredible lap today? Colorado's Nathan MacKinnon. Had MacKinnon not been injured, Coyne would have likely been relegated to the commercial break where she'd demonstrate how the lap around the rink would work before the cameras came back to watch the men do their best. But MacKinnon, who is a student of the game, knew there was someone who likely could hold her own when it came to speed in the rink. MacKinnon reached out to Coyne via Twitter and asked the speedy American star if she'd take his spot in the event. But let's pump the breaks here because had the Skills Competition gone down according to the NHL's plans, Coyne's lap would have only been seen by those in attendance in San Jose. The fact that both NBC and Sportsnet captured her lap was because she was in MacKinnon's spot as one of the actual competitors in the Fastest Skater event. The NHL wasn't holding her back from showing off her wheels. They're trying to market their stars in their event. That's just Marketing 101, and I can't fault the NHL for making the NHL All-Star Game about the NHL and its stars. 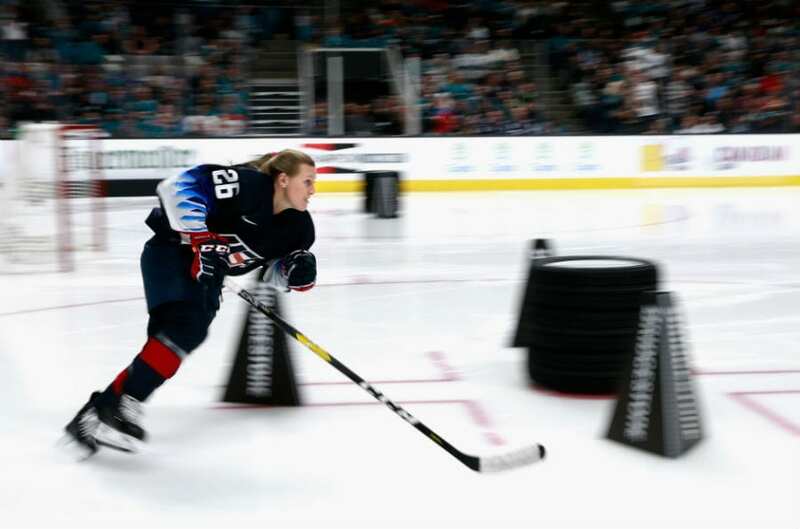 I can fault NBC and Sportsnet, though, for opting to not show the women demonstrating the skills to the public not sitting inside the SAP Center. The problem, however, goes to a larger issues within women's hockey, and that's exposure on television. Half a dozen games broadcast on TV, some YouTube games, and grainy highlights posted on social media won't get the exposure that the women's game desperately needs to become a mainstay on sports highlight shows. "What are the answers, Teebz?" you ask. Well, the first step is to follow that whole "one league" dream that everyone keeps demanding, but only two people can solve. Once that happens, this new Women's National Hockey League can fall under the NHL's watch, and I would hope that they would include a weekly televised game in both the Canada and the US on the NHL's national media partners in Sportsnet and NBC. The enemy of the women's game right now isn't the NHL or men's hockey or men or the apathy that most hockey fans show when it comes to women's hockey. Hockey Canada and USA Hockey have done their parts in making the World Championships and the Olympics must-watch TV when it comes to women's hockey, but they can't run weekly tournaments. That comes down to the two women's professional leagues, and the fact that they have no national media partner who broadcasts games regularly is the major reason why people didn't know that Kendall Coyne was one of the fastest humans on the planet before tonight. In states like Massachusetts and Minnesota, women's hockey is hugely popular because it gets its fair share of coverage locally with some regularity. Women's hockey has long been beating the drum about "you can't be what you can't see". Those are the goalposts onto which women's hockey writers should have their crosshairs fixed, and it starts with demanding that the professional women's leagues either come together to become a stronger product or by having each of the leagues going out to find a national broadcast partner. If you recall, the NHL was once mocked for putting games on the OLN network. The NHL worked through this to prove its product was a viable entity, and they've since been able to sign bigger and more lucrative deals in the United States by continuing to deliver ratings and advertising dollars to its partners. It didn't start with an NBC deal, though, and that's what the leagues and writers need to realize. Time slots on Sportsnet and NBC Sports are expensive. The networks are there to make money, and the women's game simply can't provide the same monetary return as other sports at this time just as the NHL couldn't provide the same return in 2005 when they signed with OLN. This is simply the reality of where the sport is on the sporting landscape right now, and it's a harsh reality that one needs to accept if this sport is ever to move forward. The lack of television broadcasts are the answer to "why isn't this sport more popular". The only way to fix that is to find a way onto television regularly. I'm not a television executive by any means, but I suspect that if the leagues could likely find a somewhat-obscure network to take a chance on one or both of them, then popularity of the women's game will grow by leaps and bounds as the die-hard fans turn casual fans into more dedicated fans and so on and so forth. Y'know, kind of similar to how the NHL grew in non-traditional markets in the sunbelt with local broadcasts and a national deal with an obscure television network. The goalposts need to be moved. This would certainly change the playing field if a television deal was struck. This is entirely what the women's hockey writers who are screaming about Kendall Coyne's performance tonight should be asking their leagues to investigate. If the problem with women's hockey is that no one is watching, it's time to get onto the medium that most people watch. The Hockey Show, is back to its usual hijinks tonight as we dive into the hockey world. Beans and I have a number of things to discuss from the hockey spectrum as we try to speculate on who of the old boys' club that the Oilers are running will take over as GM after Peter Chiarelli was dismissed. There are some interesting names out there - Jari Kurri has done good work with Jokerit as their GM, Esa Tikkanen is out there somewhere, and there must be demand for Reijo Ruotsalainen to make a return, right? - but outside of the Finns mentioned, is there anyone who is willing to don the hazmat suit and wander into that radioactive environment? As stated above, Beans and I will look at a handful of moves that Peter Chiarelli made that likely began to cement his fate as the Oilers sent him to the unemployment line. We'll discuss the other firing that happened on the same day as the University of Lethbridge dismissed women's hockey coach Michelle Janus and the entire situation surrounding her and the school. We'll talk about the Bisons men's and women's hockey teams and what they're up to this weekend, we're on the road for next week's show, and we'll discuss the worst secret in Winnipeg and how that may affect everything next season. It should be a show with lots of info, so make sure you get to a radio or internet-enabled device at 5:30pm CT! Tonight, Teebz and Beans discuss Chiarelli and the Oilers parting ways, Janus and the Pronhorns parting ways, the Bisons' upcoming weekend, next week's roadtrip, the latest news on the newest team in the Manitoba capital and much more only on The Hockey Show found exclusively on 101.5 UMFM, on the UMFM app, on the UMFM.com web stream! 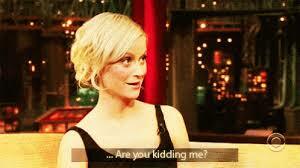 I was doing some reading tonight when I came across someone who mentioned a website called Youth Hockey Hub. The discussion was around the ranking system that the site uses to rank youth hockey teams at various levels from around the states of Minnesota and Colorado, and I found this curious because I didn't recall there every being a ranking system for hockey at the bantam, peewee, or squirt ages when I was growing up. Hockey was all about having fun, learning fundamentals, and being part of a team at those ages, and, while there were obviously kids who stood out from the pack, I can't recall there ever being rankings for non-committed players when it came to their future hockey days as well. While it's always encouraging for kids to see their name or their teams' names up on websites with scores and analysis, I'm also in the camp that it really shouldn't be used for anything more than entertainment, especially when it comes to putting unnecessary pressure on kids to perform to maintain their team's ranking. In my beliefs, hockey at anything below the CHL and USHL should be focused on developing good hockey players where they have the skills and talents to move on if they choose to follow that path. Winning and losing are parts of the game that one needs to process, but until it becomes a full-time job outside of school, bantam hockey players shouldn't have to worry about a loss in February that drops them down the rankings. Another one of the most popular features is the Now Rankings, where teams in Minnesota and the larger United States are ranked on the site. According to the site, the Now Rankings are "a combination of a team's winning percentage, their opponent's winning percentage, their opponent's opponents winning percentage, average goals differential, and how recent the games were played (i.e. games in October weigh less in February than the games played in February)." For now, readers can find rankings in Minnesota, Colorado, and the wider US rankings. You can also view historical rankings to look back on previous years and see who dominated in the past. The rankings range from Bantam AA to Boys High School A, which means that the dominant teams of all age ranges will be carefully tracked. 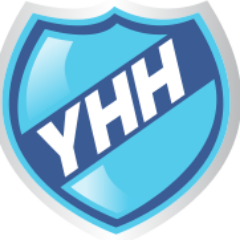 Along with keeping track of tournament scoring and rankings, Youth Hockey Hub also keeps up with young hockey players who may one day be playing in the NHL. In fact, the site tracks the top potential prospects by year all the way up to 2023. However, in order to see these future stars, you have to sign up for the Youth Hockey Hub Premium Subscription, which costs $6.95 per month or $19.95 for a whole year. Along with exclusive access to these top prospects, Premium members also get access to "Exclusive YHH Stories." Is he serious - "young hockey players who may one day be playing in the NHL"? Look, I get the notion that Minnesota is the hockey hotbed in America and that there are a lot of Minnesota-born players who do end up playing at higher levels of hockey including the NHL. The issue I take with this is that these bantam players are 13 and 14 years-old. They still have their whole lives ahead of them when it comes to doing anything they want, and the vast majority of them won't see the NHL. Stop putting this kind of craziness on kids at that age! As of 2017-18, there were 37 Minnesotans on NHL rosters. Of 713 total NHL roster spots at any time, those 37 players represent 5.2% of the total population of the NHL. While the likelihood of these bantam, squirt, peewee, and high school players going on to play NCAA, USHL, or some other higher level of hockey is greater, 37 NHL players is a tiny segment of the total number of players from age 10-14 in Minnesota (squirt to bantam). In June 2018 as per this article, there were "18,839 8U players in Minnesota". Assuming that the 14,030 boys registered for hockey at age 8 remained in the game through to the squirt level, the 37 NHLers represent a whopping 0.26% of the total number of boys registered at the squirt level - a level that Youth Hockey Hub tracks for rankings. At eight years of age. Eight. EIGHT. YEARS. OLD. I get that hockey has become ultra-competitive at the top levels to the point where players are tested on everything from fitness to skills to interviews. Somewhere down the line, though, this has gotten out of hand. The top 14 year-old that I played with never even played hockey at the university level. I feel like we're asking kids to become professional hockey players long before they've learned how to properly setup a one-timer or stopped losing baby teeth. At what point can we just say "have fun, play the game" without having to be judged for how good a player or team is? Maybe I'm the crazy person for thinking this? The Sixth Sense. The Usual Suspects. Fight Club. These three movies are examples where a great plot twist is introduced near the end of the movie that cause people to talk about and remember the movie for years to come. I won't spoil any of the above films by revealing the plot twist, but there was a major plot twist today in Canada West women's hockey, and it was one I didn't see coming at any point after all that has happened. I'll give Global Lethbridge's Matt Battochio all the credit on this one as he broke the news on Twitter about an hour ago. JUST IN: @UofLPronghorns announce Michelle Janus is no longer the Head Coach of the women's hockey program. The University of Lethbridge says they will not be making any further comment. This is a move that is not only unexpected as the University of Lethbridge was preparing to defend itself and Janus in court against four players in a $1 million civil suit, but removing Janus at this point in time while the Pronghorns are in contention for a playoff spot seems entirely untimely if not a curious move. It's entirely speculation on my part, but perhaps the university felt its case in the civil suit wasn't as strong as they may have originally thought. The announcement seems to have been planned by the university as the women's hockey team's webpages with Janus as the head coach have already been removed, and Janus' name and position have been removed from the team's roster page. The scrubbing of Janus' name from the pages would have taken some coordination between university departments, so the announcement made earlier and reported by Battochio seem to be the final steps in closing the book on Janus' career with the Pronghorns. By stating that the university will have no further comment on the dismissal allows them to proceed quietly with what I believe will be a settlement with the players in the lawsuit. Make no mistake that Lethbridge's documented poor records over Janus' tenure from 2015 until today seemed to no factor in the dismissal. As I pointed out on this very blog, Janus' record as head coach was less than impressive as shown by the records below, and the 1-23 record in the second halves of the previous two seasons - seasons in which they fell from second-last to last over the second halves - would normally be enough to prompt questions about the effectiveness of the head coach and his or her staff. 2018-19: 4-10-0-2 - 14 points (7th) with playoff spots TBD. 2017-18: 3-9-2-2 - 15 points (7th); finished 3-18-2-5 - 18 pts (8th). 2016-17: 2-11-1-2 - 10 points (7th); finished 3-21-1-3 - 14 pts (8th). 2015-16: 6-7-2-1 - 23 points (7th); finished 9-14-4-1 - 36 pts (7th). It appears that assistant coach Hailey Wood will take over in the interim just as she did in 2014-15 after Chand Kaip left the program. With a playoff spot seemingly in reach for the first time in a few seasons, it seemed as though Michelle Janus may finally lead her squad to the promised land with a few more wins and a little help. Whatever the reasons were to dismiss Janus today, the University of Lethbridge likely altered that plan in a significant way today and I can't help but feel for the players who were playing their tails off in trying to make the playoffs. And with first-place Manitoba coming into Nicholas Sheran Arena this weekend, things don't get any easier for the Pronghorns. I've reached out to the players named in the lawsuit for comment, but I haven't received a response yet. I'm not sure where this dismissal leaves them regarding the civil suit filed against the University of Lethbridge, but perhaps the school took my advice and is planning on settling with the former players. By firing Janus and agreeing to a settlement, the university would be able to put this whole incident behind them and move forward while the players in the suit would get some closure regarding their ordeal surrounding Janus. I'm sure there may be a few non-disclosure agreements that the school will insist the players sign, and that will be up to them to decided whether that's something they want to do. But this seems like the most logical, least embarrassing conclusion for the University of Lethbridge, so I'll be keeping an eye on developments with this case over the next few weeks. The only thing that is certain right now is that Michelle Janus will not be at practice nor behind the bench this weekend when the Pronghorns take the ice. UPDATE: CTV Calgary reports that the team walked out on practice today after being unhappy with conditions on the team. Shaun Frenette has more in this report. How Is He Still Employed? 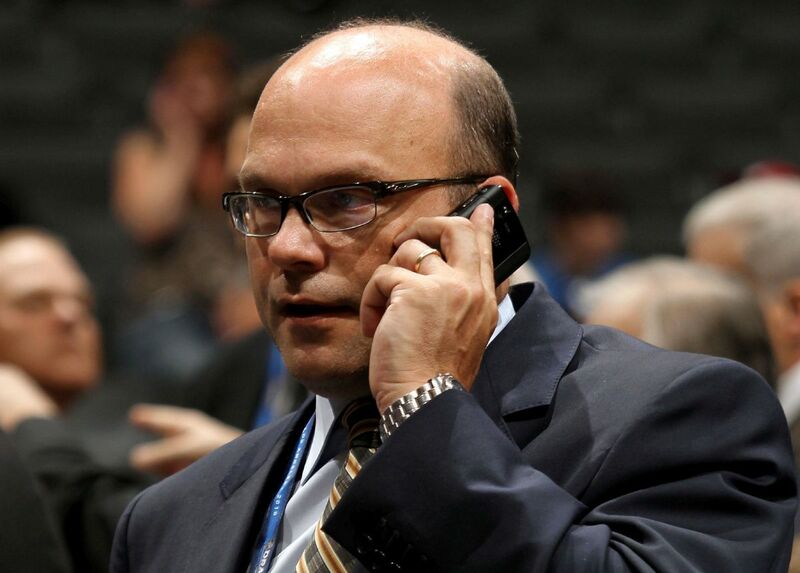 At this point in his career, you have to wonder if Edmonton Oilers GM Peter Chiarelli is on the phone with agent planning what his next steps are going to be because it seems very unlikely that he survives through to the end of the season after the latest volley of moves he made. His history already had many people questioning how he held onto his job with the Oilers, but the latest moves should spell the end of the Chiarelli era in Edmonton at some point soon. If the Oilers don't make a change, it might just be time to fold the franchise and start over in Houston. After announcing that the team had waived Ryan Spooner and Ty Rattie - yes, the same Ryan Spooner who was acquired in exchange for Ryan Strome who, in turn, was acquired in exchange for Jordan Eberle - Chiarelli announced that he had signed goaltender Mikko Koskinen to a new three-year, $13.5 million deal, essentially ending Cam Talbot's time in the Alberta capital. Koskinen, I should remind you, has 31 NHL games under his belt and is already 30 years-old. What the hell is going on in Edmonton? In seeing Adam Larsson struggle hard this season after Taylor Hall won the Hart Trophy, in seeing Milan Lucic's struggles in his time in an Oilers uniform, in seeing how Kris Russell get $4 million per season, in seeing how Eberle was traded for a woefully-underperforming Ryan Strome only to be dealt for a woefully-disinterested Ryan Spooner only to put him on waivers, in trading Drake Caggiula for the defensively-confused, idiotically-overpriced Brandon Manning, why on earth would Peter Chiarelli commit this kind of money at a guy who arguably has had a good season behind a porous, if not invisible, defence when his comparables are taking accepting contracts for far less money? When his last four games might be a better glimpse of the future with Koskinen sporting a 4.06 GAA and an .877 save percentage? When Chiarelli already has this team in salary cap purgatory? I had mockingly named Peter Chiarelli as the worst GM in the NHL at the end of December following the trades for Petrovic, Manning, and spare parts, but Chiarelli continues to move the bar lower and lower with every move he makes. Committing to Koskinen now when there are names like Bobrovsky, Varlamov, and Lehner potentially going to free agency makes no sense. Especially when you consider that both Koskinen's and Talbot's contracts would be off the books. Everything about this move reeks of Chiarelli doing anything and everything to keep his job. The fact that both Bob Nicholson and Daryl Katz are allowing this charade to continue at the expense of the team and Connor McDavid's best years is both incomprehensible and rage-inducing. And I'm not even an Oilers fan. The mess that Chiarelli has made in Edmonton won't be easy to clean up, but the first thing that needs to be done is removing Chiarelli from his position to prevent any further damage from being done. His history with the team will likely go down as one of the darkest in the team's history despite them having the league's brightest star, and that's a rather incredible amount of futility to own. Fire Peter Chiarelli. It's the only move the team has left that will win them any support from the fans in Edmonton. It was seemingly a week where the top-four teams in Canada West could pad their point totals as each faced off against a team occupying the bottom-four spots in the conference. However, if I've learned anything from watching Canada West hockey over the last few years, it's that no team can be taken for granted. Lethbridge has beaten UBC this year, Mount Royal split with Alberta earlier in the season, and Regina has taken a game off Saskatchewan - literally anyone can beat anyone on any given day! With that being said, let's get into this week's action on The Rundown! FRIDAY: Saskatchewan was looking to keep pace, if not catch, UBC in the standings this weekend with a pair of wins over Lethbridge while the Pronghorns needed points to hunt down one of the two Cougar-named teams in Regina and Mount Royal. Both teams started their aces in the paint as Alicia Anderson got the call for Lethbridge while Jessica Vance went to the net for the Huskies. And not to foreshadow this too much, but their names will get mentioned a number of times in this recap. Both teams came out with some fire in their skates as they tried to establish the pace, but the two netminders were ready for all attacks as they kept the opposition off the scoreboard. Despite the two teams trading power-play chances and Saskatchewan holding a 13-8 advantage in shots, this game would go to the second period deadlocked at 0-0. The second period would be more of the same as the teams were whistled for two penalties each, but the nets remained closed to all pucks thanks to the efforts of Anderson and Vance. Both goalies put in another clean period of play, so we'd move to the third period with the game still tied at 0-0. The third period? More stalemate hockey despite both teams pushing for a winner. Again, the teams would exchange power-play opportunities only to be denied, and this game would need some free hockey to determine a winner despite Saskatchewan leading 49-20 in shots through regulation time! Stop me if you've heard this before, but there were no goals scored during the four-on-four overtime period. It would take a fifth period to find a winner, and a turnover deep in a defensive zone is the key to this goal. Leah Bohlken took the drop-pass from Bailee Bourassa, and she wired a shot past Anderson to give the Huskies the 1-0 double-overtime victory! Jessica Vance stood tall for the Huskies in recording her fifth shutout and ninth win in a 23-save effort while Alicia Anderson was brilliant in a losing effort while making 56 stops. SATURDAY: After Friday's goaltending clinic, one had to wonder whether Alicia Anderson and Jessica Vance would be ready to go one evening later. Again, with critical points up for grabs, both Huskies head coach Steve Kook and Pronghorns head coach Michelle Janus went with their number-one netminders as Anderson and Vance got the calls once again. The good news is that both teams came to play again tonight as the Pronghorns had chances early before the Huskies rallied back with their own offensive output and really controlled the period. The goalies, however, were still in the zone from the night before. Midway through the opening frame, though, Emily Upgang drove the Lethbridge net hard where Anderson made the save, but Brooklyn Haubrich was there to net the rebound as the Huskies went up 1-0 at 11:42. It appeared we'd head for the intermission at that score, but a late power-play gave Saskatchewan the opportunity they needed to double their lead when a scramble in front of Anderson with the seconds ticking down saw Bailee Bourassa get the puck past Anderson at 19:54 to put the Huskies up 2-0! At the break, Saskatchewan held a 19-3 lead in shots as well as Alicia Anderson was under siege for 18 of the 20 total minutes. The second period was more of the Huskies dominating home-ice possession and shot stats, but it also featured some rather incredible netminding from a goaltender who is relied upon by her team far too often. Anderson stood tall to keep Saskatchewan from pulling away with two early power-play chances, and Lethbridge began to find their legs thanks to a power-play in the latter half of the period. However, Jessica Vance was solid when called upon as well, and we'd move to the third period with the Huskies still up a pair. The third period began with Lethbridge on the power-play, but the Huskies would kill that chance off. The teams traded shots at either end, but nothing would find twine until the final five minutes when Saskatchewan converted on a partial two-on-one. Sophie Lalor sent a perfect feed across to Leah Bohlken who beat Anderson with her shot to put the Huskies up 3-0 at 15:40, and it was simply a matter of helping Vance keep the scoresheet free of ink at that point. Despite Lethbridge having a late power-play, the game would come to a close with that 3-0 score intact as Saskatchewan claimed victory! Jessica Vance stopped 19 shots for her tenth win and sixth shutout of the season while Alicia Anderson made another 46 saves in the loss. FRIDAY: With Calgary still mathematically in the race, they should be in desperation mode for the remainder of the season. It's likely they'll end up playing the spoiler against teams who need points, but Calgary came into this weekend needing every point possible. The UBC Thunderbirds were looking to hold off Saskatchewan while trying to gather points and close the gap between themselves and Manitoba. Tory Micklash got the nod for UBC as the starting goalie after her big weekend against the Pandas one week ago while Kelsey Roberts was in her usual spot in front of the Calgary net. UBC had most of the chances in the first period, but Kelsey Roberts was content with the zero next to UBC's name on the scoreboard as she made several key saves in the opening frame. Micklash was not nearly as busy as she pushed aside two pucks sent her way, and these two teams would go into the intermission still tied at 0-0. The second period saw the tams trade power-play chances in the first-half of the frame, but we'd sit on that goalless mark for another few minutes. With less than five minutes left in the period, though, we'd see our first goal of the game! It seemed as though Rachel Paul lost the puck in a UBC defender's skates, but the Dinos forward found it in time to snap it past Tory Micklash at 15:34 to put the home side up 1-0! That would be the only puck to dent twine in the second period as Calgary took the slimmest of leads into the third period. Early in the third period, UBC's Jenna Fletcher was sent to the penalty box, and the Dinos didn't waste any time. Rachel Paul won the draw back to Delaney Frey whose shot goes upstairs on Tory Micklash just four seconds into the advantage, and Calgary found themselves with a 2-0 at the 5:11 mark of the third period! That second goal seemed to trigger the UBC Thunderbirds as they roared back in looking to cut the deficit, but Roberts and the Dinos' defence stood tall. UBC would finally get to Roberts, though, when Emily Costales found the puck in a scramble and beat Roberts with 45 seconds on the clock, but the Dinos would hold on for the 2-1 win! Kelsey Roberts was at her best in stopping 30 shots for her third win of the season while Tory Micklash suffered the loss in a ten-save effort. SATURDAY: After the loss one night earlier, UBC found themselves further behind Manitoba while Saskatchewan closed the gap between themselves and the Thunderbirds. While we're not quite in "must-win" territory yet, this may have been as close as the T-Birds have been all season. Calgary, having recorded their third win of the season, kept the hope alive with three points, and they were looking to build on that win today. Kelsey Roberts was back in net for the Dinos while Amelia Boughn drew the assignment for UBC from head coach Graham Thomas. And the Thunderbirds decided to waste no time today as they scored early and often. Just two minutes in and with all the pressure on in the Dinos' zone, UBC's Ashley McFadden picked up the puck in a scramble and zipped it up high over Roberts to give UBC the early 1-0 lead just 2:25 into the game! Two-and-a-half minutes later, the score became 2-0 when Ireland Perrott beat a couple of defenders to get a shot off that was deflected by Celine Tardif at the 5:56 mark! The period saw the Dinos find a little life thanks to a power-play, and it would be moments after the penalized player returned that the Dinos got a goal back. Sage Desjardins finishes off the solid rush by Rachel Paul as Desjardins converts the pass at 17:06 to make it a 2-1 game! That score would hold into the intermission as both teams look to add more in the second period. The second period saw Calgary run into penalty trouble as they failed to find any sustained pressure on the T-Birds, and UBC used some of that extended offensive zone time to make the hole a little deeper for the Dinos. Ireland Perrott's pass found its way through two Dinos defenders to the wheelhouse of Mikayla Ogrodniczuk, and she one-timed a blast past Roberts at 8:17 to make it 3-1 for the T-Birds. Thanks to four minor penalties, the Dinos needed a better third period if they hoped to salvage points in this one. The third period was much better for the Dinos as they skated stride for stride with the T-Birds, but they simply couldn't find room past Boughn. Late in the game, Ashley McFadden would ice this contest as she scored a shorthanded goal with 2:22 to play as the UBC Thunderbirds skated to the 4-1 win! Amelia Boughn earned her fourth win of the season in a 20-save effort while Kelsey Roberts absorbed the loss after stopping 25 shots. FRIDAY: Manitoba was within striking distance of Alberta to start this weekend, and had put a solid gap between them and UBC. The Bisons had a mission this weekend to win both games and keep the heat on the Pandas. The Regina Cougars needed to find a way past the Bisons in order to hold off both Lethbridge and Mount Royal while trying to catch their provincial rivals in the Saskatchewan Huskies. Morgan Baker would head to the net for the Cougars on this night while Manitoba sent out Lauren Taraschuk to defend their nets. The pace was set by Manitoba early on home ice as they had a couple of glorious chances only to be denied by Baker. That pressure would continue over a power-play, but the Bisons failed to convert on that opportunity midway through the period. They would not be denied for the entire period, however, as Alanna Sharman scored her third goal of the season after picking the pocket of a Cougars defender and going shelf over Baker at 13:57 to put Manitoba up 1-0! Regina pushed back, but the Bisons would find the net again before the horn went. Megan Neduzak unleashed a slapper on net that Baker could not stop, and the Bisons owned a 2-0 lead heading into the second period. Both teams came out focused for the second period as they hunted for goals, but both Baker and Taraschuk were there to spoil the party. Manitoba would find themselves with a power-play to start the third period after a penalty was assessed to Emma Coulter with less than a second to play in the frame, and Manitoba maintained the two-goal lead through 40 minutes. Why did I mention that penalty above? Just 19 seconds into the third, Alanna Sharman's initial shot was stopped, but Sheridan Oswald was in perfect position to pot the rebound, and the Bisons were up 3-0 on the power-play marker. However, Lauryn Keen would be sent off 20 seconds later, and the Regina Cougars would get their own power-play goal 14 seconds after that when Jaycee Magwood got a stick on an Emily Middagh shot from the point that eluded Taraschuk, and the Cougars were down 3-1 after 53 seconds of play in the third period. The remainder of the period saw no additional goals despite some chances for either side, and the Bisons claimed the front half of the two-game set by a 3-1 score! Lauren Taraschuk made ten saves for her 12th win of the season while Morgan Baker took the loss despite making 24 saves. It should be noted that with the victory tonight, combined with Lethbridge's loss in overtime, Manitoba became the first team to claim a playoff spot in this season's Canada West playoffs. SATURDAY: It was a new day, but the same storylines continued as Manitoba and Regina both looked to track down teams ahead of them while holding off teams behind them. Lauren Taraschuk was back in the net for Manitoba, but Regina opted to start Jane Kish in the matinee game. Kish may have wished to have been sitting where Morgan Baker was on the bench because Manitoba came out firing on all cylinders, and they put Regina in a deep hole before the game was 12 minutes old. Jordyn Zacharias scored on a breakaway at 6:05, Sheridan Oswald tipped home a puck on the power-play at 8:25, Oswald added a second goal on a set face-off play where she simply had to tap home a backdoor feed from Zacharias at 10:48, and Lauryn Keen rounded out the outburst of scoring when she scooped up a loose puck and deposited it behind Kish at 11:30 to put Manitoba out in front 4-0. At this point, Regina head coach Sarah Hodges called her team over and calmly rallied the troops as her team needed to break out of the shell-shock. The Cougars did come back to life as they looked to chip away on this lead that Manitoba had built, but the 4-0 margin would carry into the intermission after the final minutes of the period would ramp up the physicality between these two teams. The Cougars came out of the break seemingly on a mission as Elise Endicott just missed a chance before Ireland South got a shot through on a screened Taraschuk that beat the netminder at 1:06 to make it a 4-1 game. However, the Bisons would respond minutes later when Erin Kucheravy's shot went off a Regina player in front and eluded Kish at 4:48 to make it a 5-1 game. The physical play didn't slow down as there were several egregious penalties that weren't called to go along with a few that were. At the end of the period, bumps and bruises were present for a number of players, but the Bisons still led 5-1. The physicality spilled over into the third period as neither team backed away from taking a shot or delivering a hit. As the period progressed, it seemed one team was heading to the sin bin more often the other, but they would find a positive in one of those penalties. Regina was down a player when Emma Waldenberger drove the Manitoba net hard, and her pass across the crease was chipped in by a pinching Shaelyn Vallotton for the shorthanded goal at 7:24 to make it 5-2! However, the penalties against Regina would cost them when they went down two players and Manitoba struck. First, Jenai Buchanan loaded up a clap-bomb and beat Kish at 11:56 before Katie Charyrbok was on the doorstep to clean up a rebound for her second goal and first career power-play goal at 13:19 to make it a 7-2 advantage for Manitoba. After nine-straight penalties had been called against the Cougars, Regina finally saw some power-play time with five minutes to play. Emma Waldenberger would make a couple of impressive moves around Bisons penalty-killers before roofing a backhand over Taraschuk who had Jenna Merk in her crease, but the officials said it was a good goal for the Cougars and it was 7-3 was 4:29 to play. The final minutes would tick off with a few more hits and shots thrown, but the Bisons used the high-scoring first period to capture the 7-3 victory! Lauren Taraschuk claimed her 13th victory of the season in stopping 18 shots while Kish absorbed the loss after making 32 stops on the afternoon. FRIDAY: The last time that Alberta visited Flames Community Arena, they were on the losing end of a 3-1 decision. They were looking to erase that from their memories while maintaining their first-place standing. Mount Royal, on the other hand, was looking to catch Regina while fending off the Pronghorns who were chasing them. Dayna Owen got the call in the Alberta goaltender rotation while Zoe De Beauville donned the mask for the Cougars. The Pandas seemed like they were content to develop control of the game and dictate the pace, but it would be Mount Royal who struck first when Nicolette Seper made a gorgeous outside-inside move off the wing around a defender to find daylight in the slot, and her shot found room through Owen's five-hole at 9:49 to put the home side up 1-0! Minutes later on the power-play, Kate Scidmore stepped out from behind the net and beat Owen from a bad angle between Owen and the post while on the power-play to put Mount Royal up 2-0 at 15:56! That score would hold for the remainder of the period as the Cougars went to the break very happy. The Pandas came out in the second period looking like they had business to conduct, but an early penalty slowed that attack. And it would get worse as Tatum Amy teed up a blast from just inside the right face-off circle that got past Owen at 5:09 to put Mount Royal up 3-0! Despite outshooting the Cougars 13-9 in the period, they still did not have an answer for the superb goaltending of Zoe De Beauville as the Cougars took their three-goal lead into the third period. Early in the third period, the Pandas would finally solve De Beauville as Danielle Hardy's shot from the outside found a seam on De Beauville at 5:54 as the Pandas cut the lead to 3-1. The Pandas would continue to send waves of attackers in, but De Beauville continued to repel the attacks. That would pay off past the midway point in the period when Morgan Ramsey would get over the Alberta line and drop a pass for Mackenzie Butz, and Butz's shot appeared to hit someone on the way into Owen as the puck went up and over her glove and into the back of the net for the 4-1 lead at 13:07! The Pandas would get one more goal with 1:29 to play when Autumn MacDougall converted a feed from Kennedy Ganser in the slot, but the Cougars would be too much for the Pandas on this night as they won for the second time this season over the Pandas on home ice by a 4-2 score! Zoe De Beauville was outstanding on a night where she made 31 stops for her eighth win of the season while Dayna Owen was on the losing end after making eleven stops. Highlights of the game are below! SATURDAY: With the series shifting to Edmonton for the second half of the home-and-home, the Pandas were looking to even the season series at 2-2 with the Pandas while clinching a playoff spot. Mount Royal wanted to keep the good times rolling despite the 7-0 loss the Pandas hung on them the last time they visited Clare Drake Arena. Emma Pincott got the start for the Cougars while Kirsten Chamberlin was tasked to defend the Pandas' net. Both teams seemed to be a little more cautious to start this game, but the Pandas would take the lead eight minutes into the game when Cayle Dillon's point shot went through traffic past a screen Emma Pincott at 8:53 to put Alberta up 1-0 as they took their first lead of the weekend. The Couagrs had a couple of Grade-A chances in the period, but Chamberlin not only shut the door but took away any second chances by not giving up rebounds. After one period, Alberta held the 8-6 advantage in shots and the 1-0 lead on the scoreboard. The second period was played up and down the ice with chances at both ends, but both Pincott and Chamberlin were at their best in denying the chances. Unfortunately for the Cougars, Alex Poznikoff fired a laser over Pincott's shoulder at 15:57 that put the Pandas up 2-0, but it would be the only goal scored in the frame as Alberta went to the third period up two goals. The final period was all about protecting the lead, and Alberta did that very well as they allowed just three shots through to Chamberlin through the frame. None of those found twine, and Alberta would cap the game off with an Amy Boucher empty-netter at 19:11 to secure the 3-0 win! Chamberlin made 17 saves for her seventh win and fourth shutout of the season while Emma Pincott made 24 saves in defeat. With the victory, Alberta clinched a playoff spot in the Canada West playoffs! After this weekend, we have two teams who have clinched playoff spots. We have a new team in first-place in the standings. And we've seen virtually any team able to beat any other team on any night. This is one heckuva season, and we still have three weeks of games to play! There are some things that need to be pointed out after the dust settled on this weekend, so let's take a look at these things. The Manitoba Bisons and Alberta Pandas can finish no lower than fourth-place if the world were to fall out beneath their skates based on the total number of points still available to every other team. That guarantees them at least one home game in the playoffs at this time. It's possible that the upcoming series between UBC and Saskatchewan may decide who finishes in third-place and who finishes in fourth-place. If the two teams were to split the points, that would leave UBC with games at Manitoba and at home versus Regina while Saksatchewan would finish with games at Mount Royal before ending the season at home against Manitoba. Ultimately, Manitoba could determine who finishes where in the standings. With 18 points left on the table, UBC would need one point on Friday against Saskatchewan OR a Lethbridge loss of any kind on Friday to clinch a playoff spot. The season series is tied at 2-2, but UBC holds the tie-breaker against Lethbridge once one gets deeper into the tie-breaking rules. With 18 points left on the table, Saskatchewan would need two points on Friday against UBC OR a Lethbridge loss of any kind on Friday to clinch a playoff spot. The season series is 4-0 in favour of Saskatchewan, so they hold the tie-breaker over the Pronghorns. By this time next week, four of the six playoff spots could be claimed. We could see more movement in the standings as Regina and Mount Royal battle for the fifth-place spot while Manitoba and Alberta continue their battle for first-place in the conference. It's another great stretch run in Canada West! Don't miss it!